It’s such an individual thing, really. Some people snort milk out their nose at the slightest silliness (guilty), others just crack a small smile. It’s so hard to find one style that suits everyone. The best solution? A short story collection. There’s enough different kinds of stories in here (all with male protagonists, so hand this one to the boys. Which was its point, actually. ), from enough different authors, that everyone will find at least one that will tickle their funny bone. For me, it was Eoin Colfer’s story. If I had been drinking milk (or anything at all), I would have snorted it. I howled. It’s basically a personal essay about his older brother, the evil genius, and how he got his younger brother out of trouble. Seriously, it doesn’t sound that funny, but it is. Or at least it was to me. Besides, how can you not want to read a book that has a trailer like this? I've been meaning to check this one out for a while, so thanks for reminding me. I'm hoping my boys like it. The trailer was great! 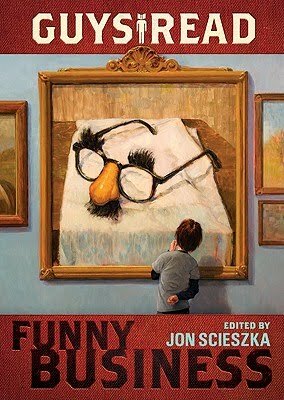 I was interested in this book because of Jon Scieszka's involvement. great trailer… going to show this to the daughter when she gets home. though she has read (and actually owns) the book. will have to brave her book shelves to find it. i had forgotten about it. thanks for the post.. and for adding the trailer. I am, too, Amira. I think they will. And Kathy and L: I know, isn't it? It's what first got me interested in reading the book. I have a couple of the Guy Reads on my classroom shelves and love the stories, but this video is outstanding. Thanks for sharing. I will add this new one to my must have list. PS My sister and I use to snort milk out our noses all the time. Brilliant trailer. So fun to see some of those faces! I have never been a big fan of Artemis Fowl, but knowing the character was based on Colfer's brother made it easier to get through the seventh book. This has been popular in my library.